First, I hope you can make it over to San Diego, as America’s Finest City boasts some extraordinary properties. This most certainly includes the recently-expanded Kona Kai Resort and Spa, a Noble House resort that I recently experienced. 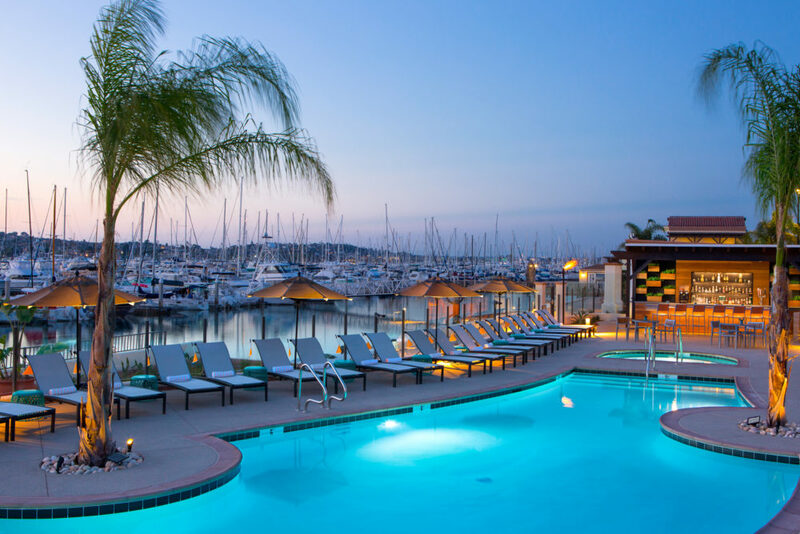 Located on the tip of San Diego’s Shelter Island, it offers a range of amenities and experiences unique to its beautiful waterfront location and rich history. The property has 170 luxurious guest rooms, including 41 brand new suites that feature contemporary island-inspired decor, deep soaking tubs and oversized balconies. The new suite I stayed in had an elegant and dramatic glass fireplace with lighting that can be set to the color of your choice. I love Kona Kai because it’s intimate, especially with décor touches like this, yet all-encompassing. The resort boasts its very own private beach replete with multiple cozy gas fire pits where you can make s’mores each evening (with kits the hotel offers) as well as multiple swimming pools, waterfront restaurants, an award-winning spa, a superbly picturesque 500-slip marina, and the renowned private Kona Kai club. For groups, there are 55,000 square feet of versatile indoor and outdoor event space. Revel in unmatched access to world-class shopping, dining and entertainment even just steps from the front door. You’ll also enjoy partaking in the hotel’s exclusive Luxe Club amenities. Like a home-away-from-home, the hotel’s Luxe Club benefits include delicious breakfasts, light lunches, evening tastings with happy hour house wines and cocktails. The happy hour, in particular, is a fun, lively and communal atmosphere among guests, and there’s plenty of affable staffers on hand to ensure every craving and necessity is met. This hotel also features complimentary bicycle rentals, a second-floor outdoor mezzanine and a 360-degree rooftop view that provides incredible sights of the Los Angeles hills and skyline. That fresh outdoor space also hosts the fitness center and weekend “cinema under the stars” events. Luxe Rodeo Drive Hotel is certainly a premier choice for an immersive visit to Beverly Hills. For those who love a southwest desert-chic ambiance is the legendary JW Marriott Scottsdale Camelback Inn Resort & Spa. Nestled on 125 acres, this AAA Four Diamond resort’s tranquil setting, private hiking trails, world-class amenities, and dynamic interior and exterior architecture offer an authentic Arizona getaway. If you’re a gastro-traveler like myself, food and beverage is a downright essential part of a vacation experience and, fortunately, Camelback Inn delivers on this front as well with seven eateries at your disposal. Their signature on-site restaurant—Lincoln, a JW Steakhouse—is unequivocally one to not be missed. It offers a traditional steakhouse concept with modern touches, including decadent dishes and processes that exemplify culinary ingenuity. The resort also houses Rita’s Kitchen for fabulous breakfast, brunch, lunch and dinner either indoors or al fresco, as well as Sprouts at the Spa and the pool-side Hoppin’ Jacks, which offers casual options such as pizza and sandwiches. In addition to the dining options on the main property, Acacia at Camelback Golf Club has an open-air lounge with an outdoor fireplace where patrons can partake in American style fare.